Prepare the meatballs: Bring 1 cup water to a boil in a small saucepan. Stir in jasmine rice, reduce heat and simmer 15 minutes or until rice is almost tender. Drain and cool. Combine rice, breadcrumbs, and next 6 ingredients (through 1 garlic clove). Shape mixture into 18 meatballs. Heat a large nonstick skillet over medium-high heat; coat pan with cooking spray. 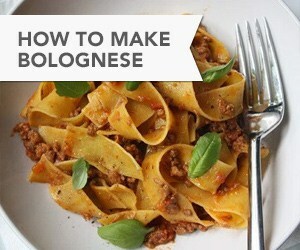 Add meatballs, cook 5 minutes, browning on all sides. Cover and reduce heat to medium. Cook for 10 minutes or until done, turning often. Remove from heat and keep warm. Prepare the bok choy: Cut each bok choy in half lengthwise. Rinse under cold running water; drain well. Arrange bok choy in a steamer basket, overlapping pieces.Heat oil in a wok or a large skillet. Add 1/4 cup onions, ginger and 1 garlic clove. Sauté 30 seconds. Place steamer basket in pan. Combine water and next 4 ingredients (through red pepper) and pour over bok choy. Bring to a boil, cover, reduce heat and steam over medium-low heat for 15 to 20 minutes or until bok choy is tender, rearranging boy choy after 10 minutes. Remove the bok choy and steamer basket from pan; cover and keep warm. Combine sherry and cornstarch; add to pan. Bring to a boil, cook 1 minute or until slightly thick. 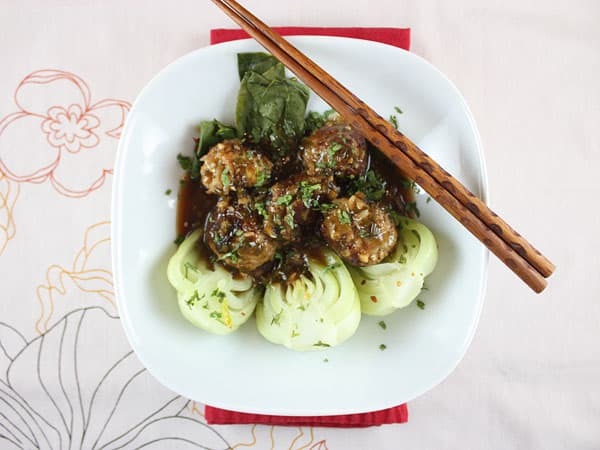 Serve 4 to 6 meatballs per person, with 3 or 4 bok choy halves and drizzle with the sauce.